We have talked about picking a point and navigating to it. And we have talked about picking a compass bearing and paddling toward it, but how about plotting a bearing on a chart, and figuring out what the compass bearing to follow would be? It is exceptionally easy. But first we need a plotting tool. I surfed the web, and found one, but really wanted direction on how to make one. I couldn't find any, but I knew it wasn't that hard. So this is what I did. In Adobe Photoshop I created a compass rose with an inner and outer ring. 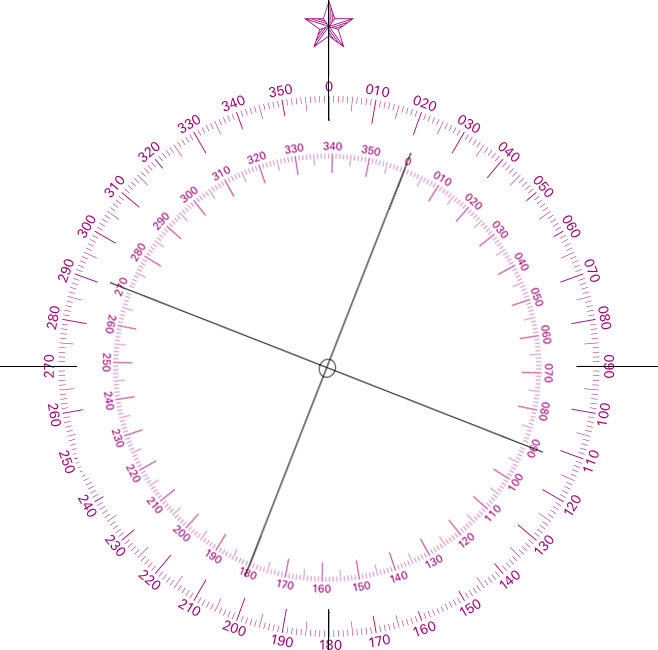 The outer compass rose indicates true north, and the inner compass rose is adjustable to indicate magnetic north. I then spun the smaller, inner rose to the declination for Alaska, flattened the image, and too it to kinko's - which is a US based photocopy shop. I had them print it on clear acetate. I cut it into a smaller square. Punched a hole in the middle and added a string. Cost? 81 cents. I need a better round string, and I would like the acetate to be a bit thicker. But it works just fine. So once you have a plotter, this is how you use it. Place the center of the plotter over your location, or in the case of the video, a future location. In this case using a ruler I drew a potential route on my chart, and now I am going back to add bearings and distances. 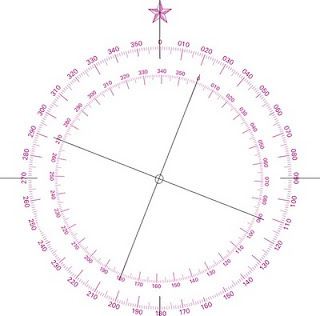 Align the Star on top with vertical running lines on the chart that represent North. Take the end of the string and lay it over the line you previously drew as a potential course. You now have a choice. You can read the outer ring to get a true bearing, or read the inner ring to get a magnetic bearing. In this case I did true, and labeled the written bearing with a 'T'. But I could have just as easily read the magnetic ring and labeled it 'M'. To get distance is even easier. Take the string from the plotter and use it to measure the distance of the leg you have just labeled. You could then take that distance to the scale on the bottom of the chart, but it is easier - particularly on these big charts - to take it to the side, near where I am working. One minute (there are 60 minutes of latitude in 1 degree of latitude) of latitude is one nautical mile. label the distance under the line with an 'NM' for nautical mile, which is 1.8522 kilometers. This is how you plan multi day trips. plotting out bearings with distances. You can then see how long each leg will be, to give you an idea of paddling distances. plotting from Paddling Otaku on Vimeo. While we are discussing navigation - and I am not done yet - I wanted to talk a little bit about GPS. I am a fan of GPS units as long as they don't become the primary focus of the user. Be they hiker or paddler, I like to think of GPS as a tool to confirm good solid navigational work on the part of the user. Early on I used GPS to see the speed at which I was paddling, because there is no better way to see if you are using your torso than the speed you are going. You will paddle faster with significantly less work using your torso and legs than you will with your arms. That said, it's been a long time since I have done this, but for new paddlers it is an effective method. Generally I use a gps to make waypoints at important locations. A put in/take out. The start of a crossing. a good campsite. But I tend to make a waypoint, and then turn off my GPS. This saves batteries, and also helps me keep my focus where it needs to be. On my paddling and the environment around me. I want to relate two stories about the use of GPS. the first is a hiking story. I was hiking in an area with terrible maps, only slightly less terrible than the trail markings. I had made a waypoint at the trail head, As well as a swimming hole I thought I might go back to, and a stream crossing. I soon realized that I was seeing things in the real world that weren't lining up with the map, and things on the map didn't match the real world. I started to get that little feeling in the pit of my stomach that things weren't right. So I literally sat down in the middle of the trail, spread out a map, and based on where I thought I was, figured a bearing to where the car was, and also calculated a distance. When I was done, and thought I had a pretty good understanding of what was going on, I took out a GPS and told it to 'goto' the car at the trail head. This gave me bearing and a distance. I was off by a few degrees, and the distance was close enough. It told me that I knew where I was. It confirmed the map work, and let me relax a little. This is a good use for GPS, in my opinion. The second story is a paddling story. At the end of a week of paddling, along a group of barrier islands with a friend, we decided to skip our last campsite, and cross a sound back to our car and put in. It would only add 3 or 4 miles to our days journey, but we were tired, and wanted a real meal. As we were getting close to our crossing the weather changed. We got an unexpected squall, and we hunkered at a small island at the beginning of the crossing. We waited about 45 minutes, once the squall passed - even though we still had some wind, and swell - we realized that this was our opportunity to make the crossing and get to safety. We picked a landmark on the far shore - slightly upwind of our destination - agreed on a compass heading, as we both had deck compasses and headed off. We had a fairly big swell, and my biggest fear was a power boat, trying to get home in lull after the squall - as we were - not seeing us, and running us over. I told my friend to keep his head 'on a swivel' so we could see everything happening around us. The last thing we did was this. He had a waypoint for the car, and I created one where we were. He told his gps to 'goto' the car waypoint, and I told mine to 'goto' the point I had just created at the start of our crossing. So his GPS would tell us distance, speed and bearing in relation to where we were going. My GPS would tell us distance speed, and bearing to where we were coming from. At any point we knew - if we had to retreat - where safety was closer. In front or behind. We knew how long the crossing would take because we were monitoring our speed. But here is the most important piece of information that we got from the gps units. Kayaks are small craft and very susceptible to being pushed in a direction other than that intended. It is a concern on crossings that while we paddle forward, a current may push us sideways. With the two GPS units telling us bearings to our way points, we could see how we were moving in relation to those waypoints. We could tell if we were moving sideways instead of forward - though sometimes it can be both. The only time I am a fan of using gps with the unit on for a long period of time and in front of the paddler where it may cause us to lose focus on our surroundings is on crossings. In part because it is good to know how fast I am going, and how long the crossing will take, but it is that potential for side to side movement that I am most concerned about, because without a gps, or careful sightings with a compass - which is not easy to do in the middle of a crossing - You may not be aware of that unintended direction. First I need to explain that this blog was envisioned purely as an instructional resource. I didn't want to get into many of the things - at least until I was done with instruction - that so many other blogs do, and do well. I am at my core a kayaking instructor. But some recent events occurred that I feel I should address. It has been my privilege to teach for an amazing outdoor school. I work for them on occasion and have done so since becoming an instructor - for them - in 2006. I was also a student of theirs in 2000. When I work for them I teach in Alaska's Prince William Sound. One of the most beautiful places I have ever been, certainly one of the best paddling destinations in the world. It is full of wildlife, both marine and otherwise. It is surrounded by glaciers and mountains. It also bears the scars of the infamous Exxon Valdez oil spill. The Valdez spill - which many thought, until recently was the worst spill in US history, was in fact relatively small (not even in the top 20). 32 million gallons is the high side of the estimate for how much oil was released into the sound. It occurred on March 24th 1989. The scars are still visible today. At low tide, in some locations - particularly the east shores of certain islands - you can smell oil. This happened to me, as myself, two other instructors, and 13 students were moving boats for the days paddling. I smelled it, and wasn't sure what I was smelling. I asked another, more seasoned instructor and he confirmed what I was thinking. He then pointed above our heads to the rocks, where a black line was clearly visible. This was an oil scar from floating oil at high tide. This interaction occurred 17 years after the March 24th spill. Several days ago I was interested to see that the Deep Water Horizon well had been capped. 86 days after the explosion. I had planned on doing this post if it made it to 100 days without a cap occurring. And while it is good news that the well is capped - I refuse to call this a spill - It still pumped oil into the Gulf of Mexico for 86 days. Compared to the Valdez spill - 32 million gallons - DWH pumped 4 million 2 hundred thousand gallons of oil per day. That is 357 million gallons of oil. While PWS has recovered in terms of tourism and fishing, though fishing is still smaller than before 1989 - in fact, I have been told that all wildlife visible to the paddler is about one tenth of what it was before the spill. I weep at the thought of what havoc that oil in the Gulf of Mexico will bring. Between tourism dollars, and the income of commercial fisherman, not to mention the death of sea life, and impact on the ecosystem. This is something that we need to think about if not as kayakers than as inhabitants of planet Earth. I am sure fewer people will be kayaking in the gulf coast for the remainder of the summer, and likely for years to come. I read an article in the NYT about the impacts on the oyster industry, which is having impacts on the burlap sack industry, and the chicken feed industry. Everything is connected, and I think that most people don't realize that the things they do have an impact on the environment as a whole. Yesterday I was on a NYC subway and saw an advertisement for Shell oil. it was something to the effect of ' lets change the future, starting yesterday' to which my first thought was - too late! Change is difficult. But the time for change has come and gone. I am proud to say that people all over the world read this blog, and I can only speak for Americans, but we need to make dramatic changes to our lifestyle and reduce our dependence not only on foreign oil, but on all oil. We must as a species change the way we do many things. The way we drive, the way we shop, the foods we eat and so on, and so on. As an aside, I am in no way perfect in terms of impact. But it is something I am pretty diligent about. Even so I have room for improvement. This is a good article on how to boycott BP without helping Exxon, but that is really only part of the problem. We need to change the way we do things. The one thing that is encouraging is that even little changes make an impact when done by many people. This is a video I ask my Leave No Trace students to watch, and if you haven't seen it yet I encourage you to as well. There are so many things that you can do that are simple that make an impact. Please think about making changes to the way you do things before we have another Deep Water Horizon type of incident. The next one will be worse, and this one is pretty bad. Preparing for these two weeks of rolling on the blog took a lot of work, and unfortunately came at a time when I have been very busy. I wanted to have great video for lots of great rolls. I shot video of a student named Heather working on her hip snap, but the camera placement wasn't very good. So I re-shot the hip snap of myself. And then, just as I was writing how easy it was to roll, my roll fell apart. I went last week with my whitewater friend, solely to shoot rolls, and while I could roll, I didn't miss any, I wasn't happy with them. They weren't fluid, and flowing the way they should be. My head would come up a little, My sweep roll - which is generally my emergency roll because it is so fast - didn't want to work. I never swam, but I wasn't very happy with the outcomes. And the reason is simple, I was thinking about it. I wasn't taking my head out of the game. Today was a different story. Again Andy - my whitewater friend - wanted to go for a paddle, but it was just a very different environment. We talked for a while about our families, while splashing about in the water, we did some rolls, he in his whitewater kayak, me in my Delta. Everything flowed beautifully. I worked on balance bracing which is the beginnings of my forays into Greenland rolling - I could use a Greenland teacher if anyone knows someone - and even moved my seat around. My Delta has an amazing seat which not only adjusts at the back band, but can slide forward and back on tracks. I have never moved the tracks before, just leaving it where it was when it came from the factory, and after playing I may keep it an inch or so further forward. What I loved though was when I was doing the balance brace I let my seat back recline as much as I could to get my back close to the back deck, and it was a lovely amount of freedom. It still supported me lower down, but really increased how much back deck I can reach. I will continue to play with this feature. Dragon Bows Head - Even if you are underwater you can start here. Just get your hands out of the water and your paddle parallel to the kayak, and you are ready to go. Dragon Flicks His Tail - hip snap, head down. Dragon Flies Away Forward - paddle away. You need to be able to turn that switch on, that is the skill. and that is the hardest part of rolling. You're not thinking about what if, you are thinking about what next. When I spar there are also good days and bad days. Generally the days I am thinking about how to strike, I get punched in the nose. Whereas days when I just strike, I don't. That is a great incentive to stop thinking. When I think, I get punched in the nose - don't think. In rolling it is the same, but the punishment isn't quite as obvious. You just don't get back up. I bet if someone punched you in the nose every time you lifted your head, you wouldn't lift your head. Four steps, then paddle forward, because everything comes back to the forward stroke. The key to the roll is your mind. There is nothing terribly physical about it. It doesn't take great strength or great flexibility. But you need to be in the moment. You cannot be thinking about the 'what ifs'. If you think, 'What if I don't make this roll', you won't make the roll. The only thing that is real at that moment, is that you are in a kayak that must be righted. When I went to the National Whitewater Center, when I tried to roll, I was thinking about the what ifs. What if I missed my roll, I would be in the next set of rapids upside down. So guess what happened. My friend made me slow down. He did something that was very interesting. He had me do a roll, then he had me set up - Dragon Bows his head - on the wrong side. Roll the kayak upside down, move to my strong side, and roll. If you have ever tried to move your set up underwater, you know how long it takes. It is a slow process. But that slow process slows everything down. It made me stop thinking, and just roll. And the rest of the day I rolled just fine. The other aspect of the trouble I had at the USNWCC was the nature of the water. Upside down in a sea kayak, even in surf is fairly peaceful - unless your upside down in surf that happens to be crashing on a beach or rocks - It is relatively quiet. There is little turbulence even in a rolling swell. But in whitewater there is a fair amount of water rushing around you, it's noisy, and that was increasing my adrenaline and making me rush. So the biggest advice I can give to some who is learning to roll, is slow down. That, and keep your head in the water as long as possible. And this is why we say your roll is solid when you have done it two hundred times on each side. By then it is muscle memory. By then it is instinct. By then it is a reaction. And that is our goal. Just like I have a fall back for what to do if I miss my roll, I have a fall back within my roll, as a contingency. So as I said previously, If I miss my roll, I try a rodeo re-entry. If that doesn't work, the tried and true paddle float re-entry. But before I abandon my roll, I have a system that I work through. So I find myself upside down under water. I try my roll, on whatever side I may be on. If I miss my roll, and I am not on my stronger side, I move to my stronger side, and try again. If that doesn't work, I switch to a sweep roll. Which I will detail in a later post. If my sweep roll fails, and I am not exhausted or out of breath - I can usually grab a breath on a failed roll attempt - I try one more thing. The extended Sweep roll. If all of those fail, I wet exit. I can then gather my thoughts, asses my situation, and move onto the rest of the out of the kayak progression, primarily the rodeo. But all the while that I am attempting to roll. I am staying focused, and slow, and in the moment. There is an expression I like very much, Slow is Fast. By going slowly, we don't make mistakes. The mistakes we make when we rush something. The outcome is faster than if we rush something, and make mistakes. This is just some rolling fun, but look behind me for Andy doing his 'dead man roll'. He is really quite good, and yes, he does that without a paddle. rolling fun from Paddling Otaku on Vimeo. I break rolling into four steps, and I give each step descriptive names like the movements of Tai Chi. Step one, Dragon Bows His Head. Bow your head as close to the deck of your spray skirt as you can, while putting both hands in the water, with the paddle parallel to the kayak. The further you can reach into the water with the paddle, the better. This is what many call the set up position, and it comes from whitewater, as it's designed to protect your head. Step two, Dragon Spreads His Wings. If you set up with your hands in the water on the left side of your kayak, you can then roll your kayak to the left. You are now upside down, and underwater, but you are in the same position as you were before you rolled. If your hands were under water before, they should now be above water. Reach for the sky, and get your hands as high out of the water as you can. You should feel the cool breeze on the backs of your hands. The keel of your kayak is dry, It is time to spread your wings. Your left hand will move as close to the center of your kayak as you can, it should be somewhere above the left cheek of your bottom. 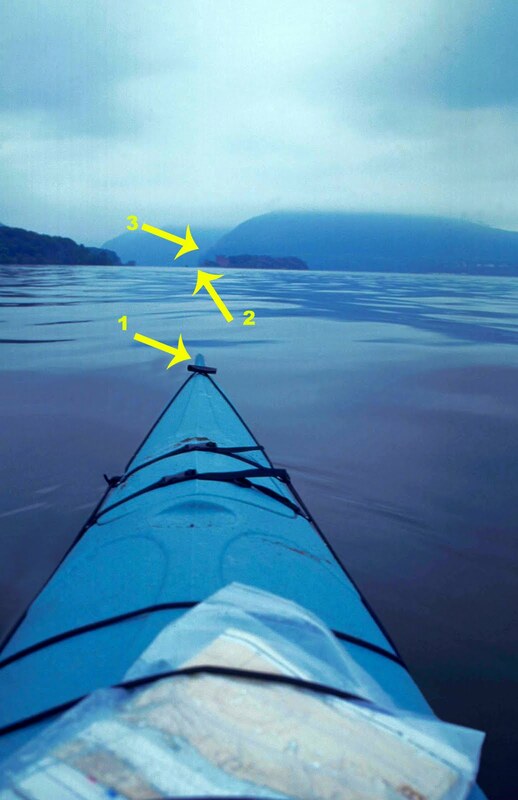 Your right hand comes out and away from the side of your kayak, so the paddle is now perpendicular to the keel line of your kayak. In other words, your paddle and kayak now make a 90º angle. Your left hand is resting on the hull of your kayak, your right hand is gently holding the paddle shaft, hopefully just out of the water. Your wings are spread. You are ready to fly. Step three. Dragon Shakes His Tail. Hip Snap. If your left hand is on the hull, and your right hand is hopefully just out of the water, you are bending your torso to the left. Snap your hips, and bend your torso to the right. Snapping at the waist, not the feet. Your feet are just along for the ride. Your head must be the last thing out of the water. This is the mistake that most people make. It is completely natural for instinct to make you pull your head out of the water, but it must be last. The boat must be mostly upright, before you raise your head. If you have done your hip snap, with the kayak mostly upright, the paddle should still be parallel to the water - as much as possible - and your head is just about to leave the water, you have shaken your dragon tail. Step four. Dragon Flies Forward. The kayak is mostly upright. Your head is in the water. Your paddle should be close to parallel to the surface of the water, Give the gentlest push with the paddle, and straighten your torso. You are now upright in your kayak, ready to do a forward stroke, because everything comes back to the forward stroke, because that is where we are most stable. 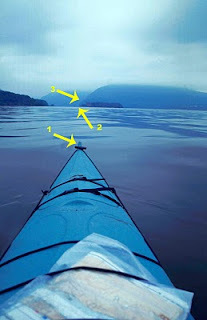 This is the C to C roll, called that because of the shape your body makes in the water, A C to the left (Dragon Spreads His Wings) and a C to the right, at the end of the hip snap, with the kayak mostly upright and our head still in the water. I think it is the easiest roll to learn, and is a great foundation for other rolls. In the video you will see the same roll, on the same side, from multiple views. From the bow, then the paddle shaft. Then from a camera mounted on the bottom of the boat, so you can see what my hands are doing when the kayak is upside down, then the side of the boat for a slightly better view of my hands. And finally from the top deck, on the stern of my kayak. This last view is in slow motion, and something to notice is my head. It comes up last, and deposits a large amount of water on the back deck of my kayak. This is a good indicator or your head coming up last. When you do it, it feels like a sheet of water sliding off your face. Because I can be a touch hyper-critical of myself, I would like my paddle to be a little more parallel to the water. There is always time to practice. rolling from Paddling Otaku on Vimeo.